With RFC 8342 bottleneck removed, many YANG modules are now published. 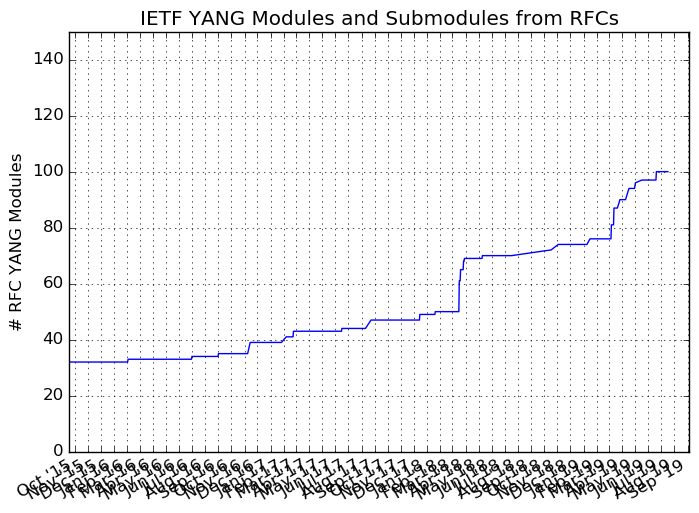 We are finally seeing exponential growth in the number of IETF YANG modules published, as can be seen in the recently updated figure below (most up-to-date figure here). So plenty of YANG modules will be published soon to further improve the hockey stick figure. And there are some more in the pipeline, for sure. Recently, the NETMOD working group finalized the “Guidelines for Authors and Reviewers of YANG Data Model Documents”, draft-ietf-netmod-rfc6087bis-20.txt. It’s a RFC bis document that incorporates an extra seven years of experience with RFC 6087, a key document that many should read. During the IETF meeting in London, we found a way to escape from the schema mount impasse, an issue that lasted since the Working Group last call in November. As a quick reminder, the schema mount defines a mechanism to combine YANG modules into the schema defined in other YANG modules. Sometimes, magic happens when people speak to each others face to face. It did happen last week, when the version 9 of draft-ietf-netmod-schema-mount was posted: this version makes everybody a little bit happier! After the Working Group last call, it should move quickly to RFC publication, unblocking two key YANG documents already in the RFC editor queue: the logical network element (LNE), an independently managed virtual device made up of resources allocated to it from the host or parent network device, and the network instance module, which can be used to manage the virtual resource partitioning that may be present on a network device such as VRF and VSI. In NETCONF, the YANG push and event stream subscriptions have three drafts now in Working Group last call. YANG Push was referenced often by other drafts in the I2NSF & SACM Working Groups. In the IETF Hackathon, Joe Clarke and I dedicated our time to the maintenance of the YANG catalog, while Mahesh Jethanandani added the MEF YANG modules, and Vladimir Vassilev focused on the validating YANG examples. The YANG catalog now contains information about 3455 unique YANG modules from the entire industry: IETF, IEEE, Broadand Forum, MEF, cz.nic, sysrepo, openconfig, and some vendors (Cisco, Huawei). Knowing that examples are key to help implementations, we should develop the toolchain to validate examples automatically. And we should have the ability to add more examples to existing published YANG modules. We should define a way to update YANG modules in a backward incompatible way. Indeed, because the RFC7950 update rules are so strict, the YANG module needs to perfect day one, which causes some delay in the specifications. It would also solve an important issue for generated YANG module, also known as native models. Publishing the RFC might be perceived as the end goal, however let’s not forget that the YANG module is really the useful part of the RFC, as it can generate code. IMO, IANA should be the source of truth for YANG modules. This is work-in-progress, with the goal to retrieve all YANG in a single rsync command: the latest IANA-maintained modules such as the iana-if-type.yang, the newly published modules from RFCs with potentially the inclusion of errata. 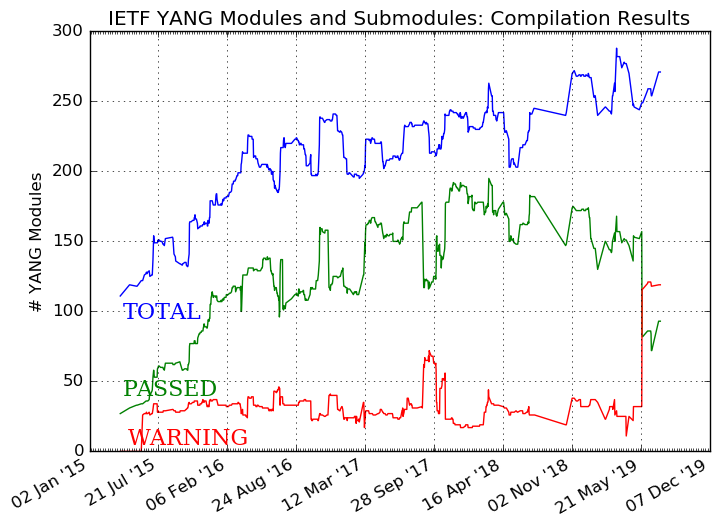 Also, at some point in time, we might have to run our IETF process directly on the product of the RFCs (read the YANG modules), as opposed to the RFC itself. "YANG Data Models in the Industry: Current State of Affairs (March 2018)"
Note also the previous “YANG Data Models in the Industry: Current State of Affairs” published following the IETF 100 meeting in Singapore.